For a while I have been putting up images from this blog on tumblr (if you like the pictures but not the words, that's the version of this blog for you). Far and away the most popular picture is this one, which reminded at least one fellow tumblrite of the Death Star. To be honest, I don't really know why this picture stands out from the others, or why you might choose to re-blog it rather than a picture of a kitten (I guess no one blogged this over a kitten... most choose this and a kitten). I do occasionally throw some things up there that don't have a blog post associated with them, and I think this might be one of them (until now). 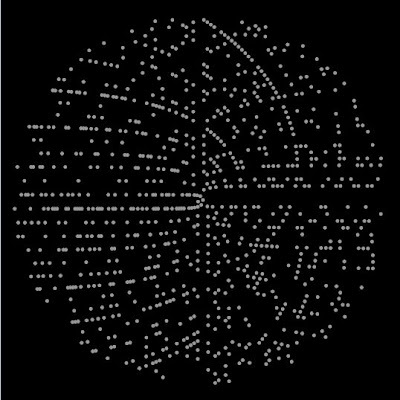 This is a picture of a quadratic number spiral with only the primes showing. The site that introduced this type of number display to me is the aptly named NumberSpiral.com, which has a great overview that I won't bother summarizing here - best that you read it there. There is lots of playing around that you can do with these spirals (you can plot polygonal numbers on them, and look for other interesting sequences, for example).